Yanis Varoufakis is in the process of becoming an important figure in Greek political life and beyond. In the break-up process affecting Syriza, which seems now well underway , he will be called to play a major role, together with the former Minister of energy, Panayiotis Lafazanis, and the President of the Parliament, Mrs Zoe Kostantopoulou. 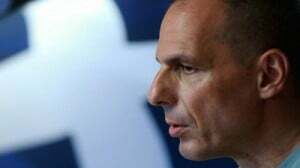 But Yanis Varoufakis has also indubitably become a major figure for the Left which is critical of the Euro and someone who will be an important factor in the political reconfigurations which are in the offing. There are good reasons for this. Yanis Varoufakis is a rare case, without being an oddity. He is an economist who has taken squarely pro-European positions in the past, but who is at present very critical as far as the governance of the European Union is concerned, and in consideration of the behaviour of European leaders. He is also an economist who came out in favor of the Euro, for essentially theoretical reasons, but who is today quietly considering the possibility of an exit of his country from the Eurozone. Evidently, his experience as a Minister, and as a negotiator, has changed the vision he had of the Euro and there is much to learn from his experience for any true Left. The Left which is critical of the Euro, or even anti-Euro, must be sensitive to his trajectory. He comes from inside the “system,” but in the same time he is apprehending it critically, and he declares himself ready to break with it rather than accepting what one is reduced to calling a capitulation, to which Tsipras finally had to give in. This is a most important point. At any rate, Varoufakis is keeping up his criticism, be it against the Diktat of July 13th or against the new memorandum which is to be ratified by August 20th. He recently declared on the BBC: “Ask all those who know the state of Greek finances and they will tell you that this agreement will not work». His moral authority and his competence as a former Minister of finances are playing in his favour. For the agreement which Greece and the other countries of the Eurozone are going to achieve will not solve anything and it is “done for” even before it has seen the light of day. The situation in Greece has terribly deteriorated in July and in the beginning of August, as a result of the measures which were taken against Greece by the Central European Bank. Some 86 or 89 billion euros are mentioned for this agreement. But today, it is clear that between 110 and 120 would be needed. Similarly, it is evident that one would have to proceed very quickly to the annulment of part of the Greek debt. Even the IMF has been saying so since early July. Yet, we know that Germany is refusing flatly and that it is dragging its feet to sign this agreement . Under such conditions, it is just as evident that the agreement, which should be concluded by August 20th will not help anything and that it will be overtaken and rendered obsolete by events to come. Moreover, the economic situation in Greece keeps deteriorating. Clearly, an exit from the Eurozone remains more than ever in the cards for the weeks, or months, to come . So that Varoufakis has become the very incarnation of a competent Left (he was a highly esteemed and recognized professor of economics), yet one which does not abandon any of its critical dimensions and who makes use of his competence in order to push ever further his criticism of the « system. » He is incidentally a product of the ruling classes (even if his father was jailed during the Greek civil war for his communist sympathies) but one who is not playing according to the codes of his background. A future leader of the anti-Euro Left ? Yanis Varoufakis was a charismatic Minister of finances, who did not hesitate to voice certain truths within the stuffy setting of European reunions. He clearly has the potential for becoming the herald of an anti-Euro Left. The fact that the decided at first in favor of the Euro, and that he then considered the possibility of an exit from the Euro, lends him an undisputable authority on this point. Moreover, he has hosted on his blog Stefano Fassina’s appeal for a front of anti-Euro liberation movements . This is an eminently symbolic gesture. For Fassina too is an insider of the « system. » He was vice-minister of finances of the Letta government in Italy. He is an influential member of the center-left party, the Democratic Party, to which belongs the present Prime-Minister, Matteo Renzi. However, today, he has become one of the most virulent opponents to the Euro in Italy and his appeal is nothing less than one of fiercest polemical tracts which have been written against the single currency. Varoufakis and Fassina are representative of the fracture which has occurred inside the « system, » or what one of my Italian friends, Professor Bagnai, calls the PUDE, or Partito Unico Dell’Euro. Their trajectories bringing them to anti-Euro positions carry the more significance for their having earlier been supporters of the Euro. One could say the same of Oskar Lafontaine who, as the leader of the SPD, was one of the founding fathers of the Euro and who, in 2013, made a radical change to becoming a resolute opponent of the single currency. This development is now very important. More and more the camp of anti-Euro, or at the very least Euro-critical economists and politicians, is being joined by people who were even recently still supporters of the Euro, but who have been caught up by the reality of the Euro and who have figured out that there is no future possible in Europe as long as one is holding onto the Euro. Moreover, Varoufakis has been attacked most viciously, not only in the Greek political spheres, where some would like to sue him for high treason, but also in the Europeist circles of Brussels and elsewhere. He has answered roundly to these criticisms on his blog and in the press. Concentrating upon himself the hatred of the Europhiles and of the supporters of the Euro, he is quite normally attracting the sympathies of those who fight against the Euro. It is evident therefore that Yanis Varoufakis is cumulating the characteristics which should make him into an example for a certain left, but not for all the left, and certainly not in the ranks of the French government, a government supposed to belong to the Left. For the personality of Yanis Varoufakis, and especially the discourse of which he is the carrier, are clearly insufferable for this moderate right disguised as a « government Left. » It is clear that nothing in his personality can be attractive to the official socialists, to people like Moscovici, or Martin Schulz and Sigmar Gabriel, Michel Sapin or François Hollande. In short, the so-called “government socialists” who are the heirs to Hebert and Noske of the Germany of 1918. Quite the opposite; Yanis Varoufakis is the very example of the fact that, contrarily to what these are asserting, there are alternatives and that austerity is not unavoidable. He is the living proof of their compromises, of their cowardice and of their multiple treasons, when other roads were open to them. Which is why he must necessarily be hated by them. But he will certainly attract to himself some of the “trouble-makers” of the French Socialist Party, at any rate those who did not accept the Diktat of July 13th, as well as the partisans of Arnaud Montebourg, and of course, the members of the radical left. Varoufakis is the living proof that other policies are possible in the European Union, even if one is entitled to think that he did not carry out this project fully, and to its full consequences. In any case, he brought it quite far, and it is not his fault if the project could not be carried through. It remains to be seen if he knows that he has become a symbolic figure and if he will be able to live up to the symbols he is presently incarnating. For, and this is the contradiction which he will have to face up to and solve, he, the man who always wanted to stand for rational government, a legacy of his work on game theory, , will have to admit that he has become an actor in a game which no longer obeys rationality but one in which symbols and ideology are occupying a major place. At the same time, in politics, analysis too calls for rational calculations. If he doesn’t want to lose himself, he will have to hold firm onto both poles of this contradiction. Jacques Sapir is a French economist who currently runs the blog www.russeurope.hypotheses.org. He studies Russian economic policy, financial crises, economic transitions, economic institutions, and individual behaviour. In 2000, he started investigating the interactions between regime changes, the structuration of financial regimes, and macroeconomic instabilities. Since 2007, Sapir’s research focuses on the current global financial crisis in general, and the Eurozone crisis in particular. Varoufakis Y., Game Theory: Critical Concepts in the Social Sciences, Routledge, Londres-New York, 2001. Varoufakis Y., in English, The Global Minotaur, Londres, Zed Book, 2011.